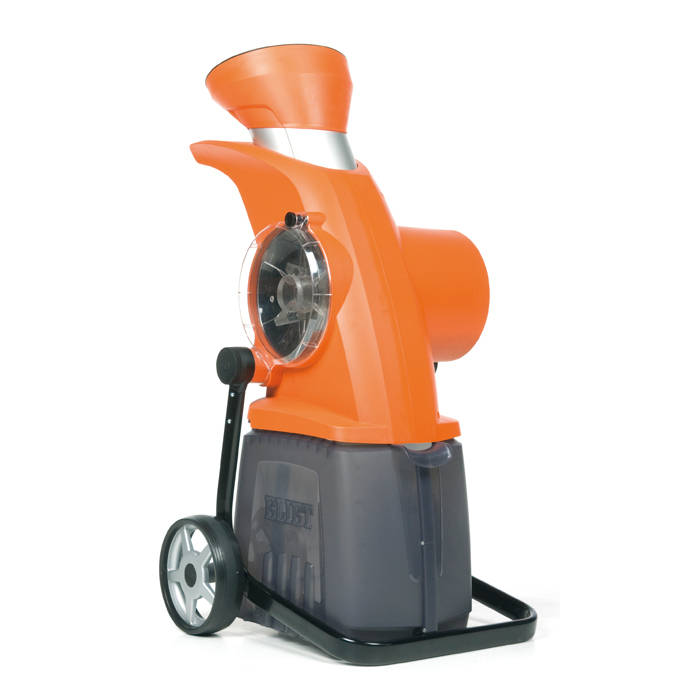 The Eliet Neo is ideal for those with small to medium sized gardens. Gardeners will be pleased to hear that the standard Neo can handle everything from soft kitchen waste and fallen leaves right through to fibrous hedge trimmings and pruning debris. A twin set of shredding disks which comprise of 12 blades make mulching simple and the Eliet Chopping Principle bruises the shredded material so that it will decompose quickly. The Neo has a low and comfortable feeding height. For safety precautions the feed intake opening is reduced. This entrance has been shaped to minimize resistance when feeding. The innovative and patented intake opening can rotate for simple feeding of bushy material. EASY MAINTENANCE - A large opening is made available to the chipping chamber by opening the transparent hatch and removing the unbreakable safety cover. The shaft that gradually becomes smaller ensures that you can easily gain access to the blades and can remove them from the machine for grinding. COMPACT DESIGN - The ELIET NEO has been designed to fold up in no time at all. The volume of the machine will be halved when collapsed, which is immensely practical in order to store it away. The wheel frame can, moreover, be used to hang it from, for example, a wall. FEED-IN OPENING - The feed-in opening of the NEO that is limited due to safety reasons was developed to ensure the least resistance possible when introducing material. The opening can be modified to introduce seriously split branches. LARGE CAPACITY - The aesthetically designed air openings were designed to provide the best possible air flow around the engine for maximum cooling. The user can, therefore, make use of the large capacity of this machine when chipping large volumes. TRANSPARENT CHIPPING CHAMBER - The chipping chamber has been manufactured of highly technical plastic composite. This innovation allowed the designers to design a better chipping chamber with the best possible and fastest chipping flow. This material, moreover, is sound absorbing, which is beneficial with regard to the noise level of this chipper. Thanks to the transparent window the user can see the chipping chamber and follow the chipping process. This will ensure that he/she can prevent obstructions and can anticipate on when blades will be worn and need to be replaced. POWER SOCKET - The power socket is beautifully integrated into the design of the machine. The cover will keep the plug in its place and will, therefore, prevent the plug from being pulled out whilst working. The cover will automatically close when the plug is pulled out. LARGE WHEELS - The NEO has been equipped with strong aluminium 250 mm wheels with large tyres (65 mm). The ergonomic handle provides the user the best possible grip and, therefore, the user can move the chipper around his garden with a minimum of effort. COLLECTION BOX - Why should we make things difficult for you when it comes to collecting chippings? NEO chippers come from the factory transparent collection box fitted. The plastic 50 litres capacity box slides easily under the machine and has been equipped with a magnetic safety switch. This makes it impossible for bystanders to open the collection box and injure themselves. CALIBRATING SIEVE - The high cutting speed and a calibrating sieve with a grid with correctly dimensioned holes guarantee the production of small and uniform chippings. LOW NOISE - The engine of the ELIET NEO is surrounded by rubber vibration-absorbing sound barriers. This ensures that the blade vibrations are not distributed through the complete chipping chamber. Feed Intake Opening Clover 4x45 mm / 4x1.8"